Corroline™ hose was designed and developed to provide customers with a universal chemical hose product which combined all the requirements they had requested for chemical plant applications, particularly the need for improved flexibility. Corroline™ hose not only supersedes but also improves upon the wide variety of alternative Chemical Hose products currently available. 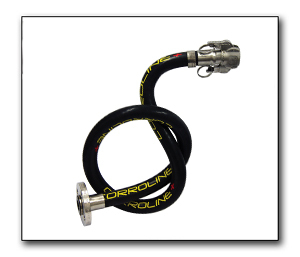 Corroline™ is built around a patented PTFE hose liner design, which is smooth bore inside but convoluted outside to generate excellent flexibility combined with 'hoop strength'. A stainless helical wire and stainless steel wire braid reinforcement add to the kink resistance, crush resistance and the resistance of the hose to both pressure and vacuum. This reinforced PTFE construction is therefore strong enough to withstand full vacuum and kinking without the need for either internal convolutions or the need to bond the liner to an outer cover, making it an ideal hose liner design, and a significant improvement upon standard products currently available. The Corroline™ Brochure is available here.